Hello friends! 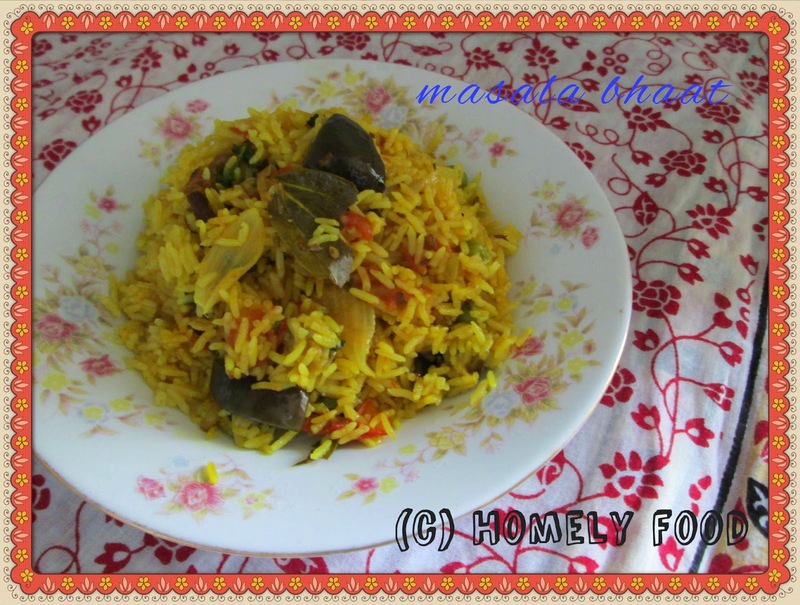 Today I have come with a rice dish called masala bhaat. It is mostly a maharashtrian dish but it has its own varieties. 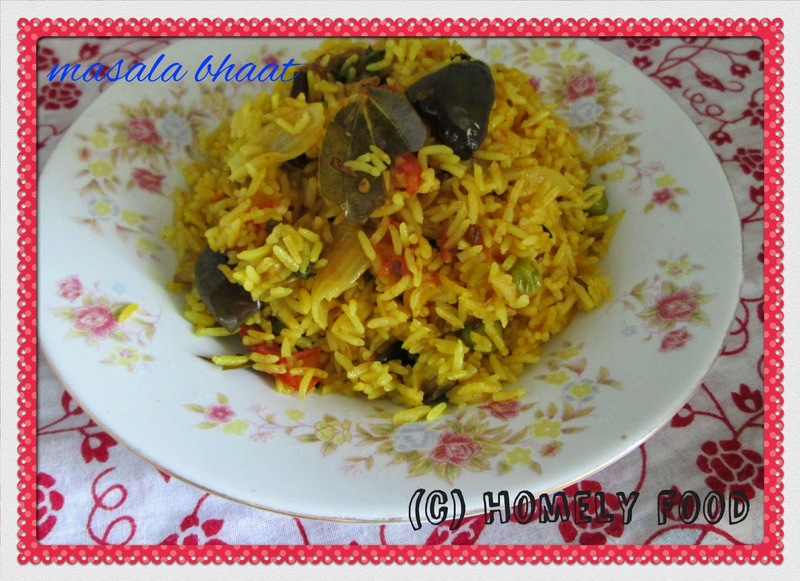 Bhaat means rice and masala means mix of vegetables and spices. So lets begin cooking this. Wash and soak rice. Heat ghee or oil and add whole spices. Then add chopped onion. Saute it till it turns translucent. Add ginger garlic paste and again saute for a min. Add turmeric powder, chilly powder and coriander powder. Mix well. Chop tomato and brinjal into small cubes and add it to the mixture along with peas. Now add salt and mix again. Add rice and water enough for rice and vegetables to cook. Your masala bhaat is done. Garnish with coriander leaves and serve it hot with raita of your choice. 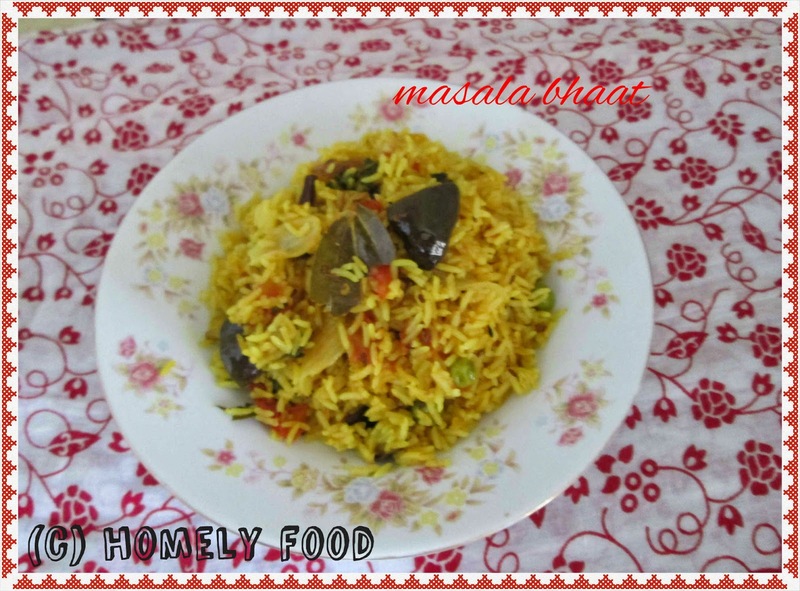 The version of masala bhaat as I said varies and it is supposed to be spicy but for our taste I have still reduced the quantity of masalas. 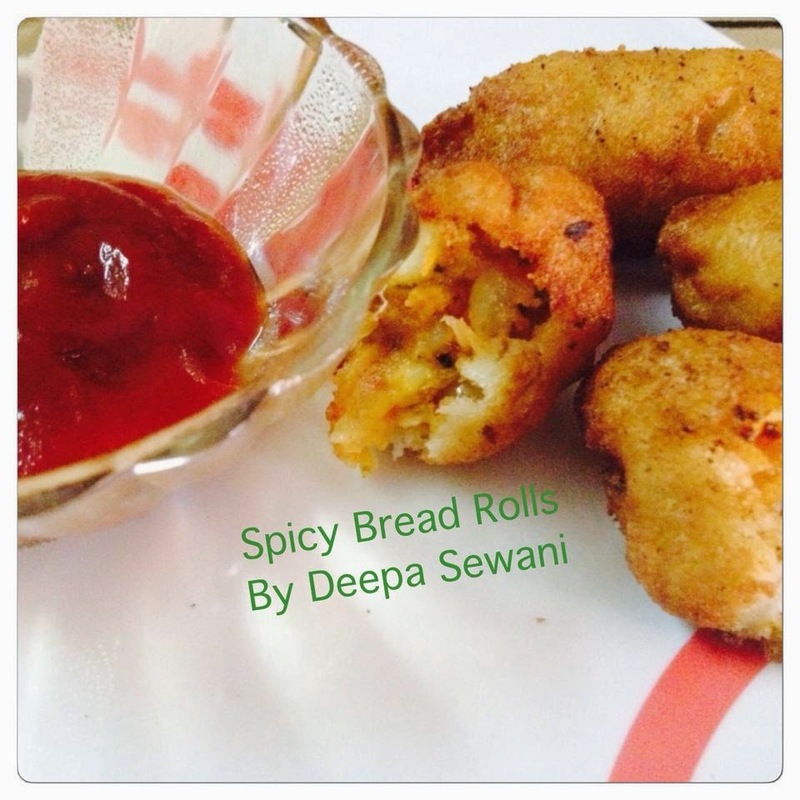 My today's recipe is a guest post by my good friend Deepa Sewani. She makes amazing dishes and she has won first prize in inside the Sindhi kitchen in first competition. I'll soon post her winner recipe. 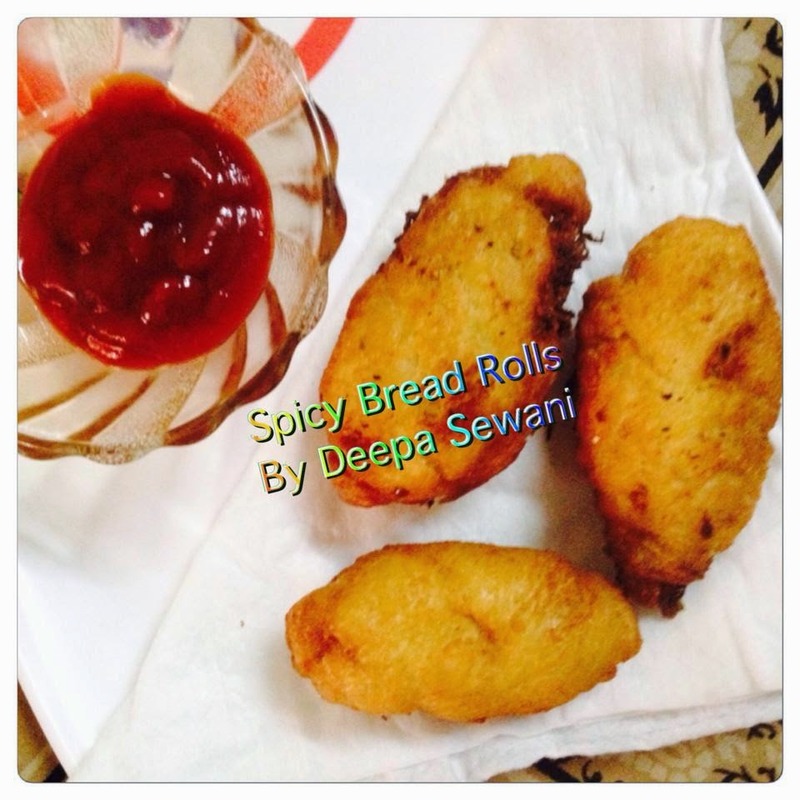 Today she is sharing one of the best and easiest and tastiest recipe called spicy bread rolls. Try it and I am sure all would love it. Add salt, chilli powder, garam masala, green chillies and coriander leaves to the mashed potatoes and add all ingredients mentioned above and mix well. Take some water in a bowl and dip a bread slice for few seconds. Squeeze the water from the bread by pressing between palms gently. Place a tbsp potato mixture over the damp bread and roll and seal the edges of the bread in such a way that the filling does not come out from any part of the bread. Repeat the same process for making more rolls. Heat oil in a pan and deep fry on medium flame till golden brown. 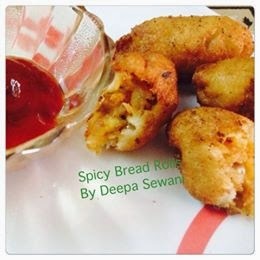 Serve bread rolls hot with green chutney or tomato sauce. Well I am trying this soon. I am sure kids would love this roll a lot. Hello friends! I am sure looking at the title you must be wondering what is that? 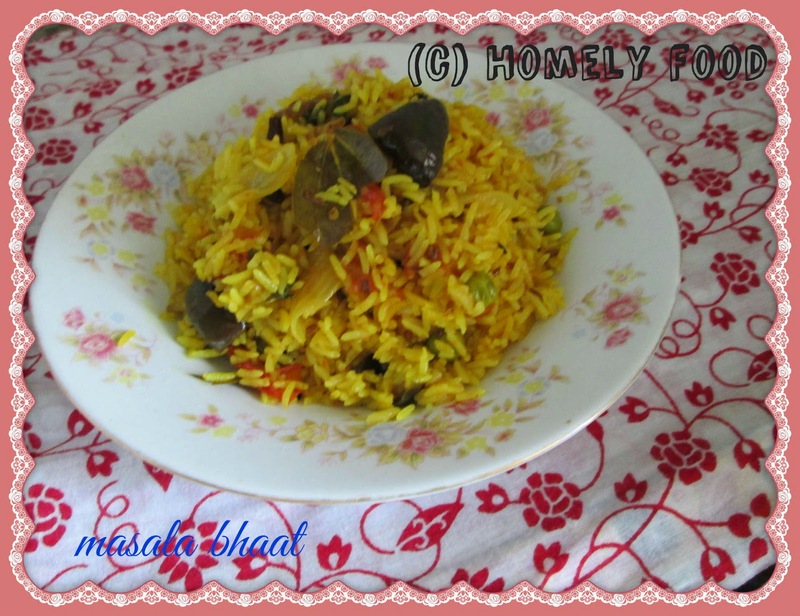 Well, its a simple quick easy dish to make. 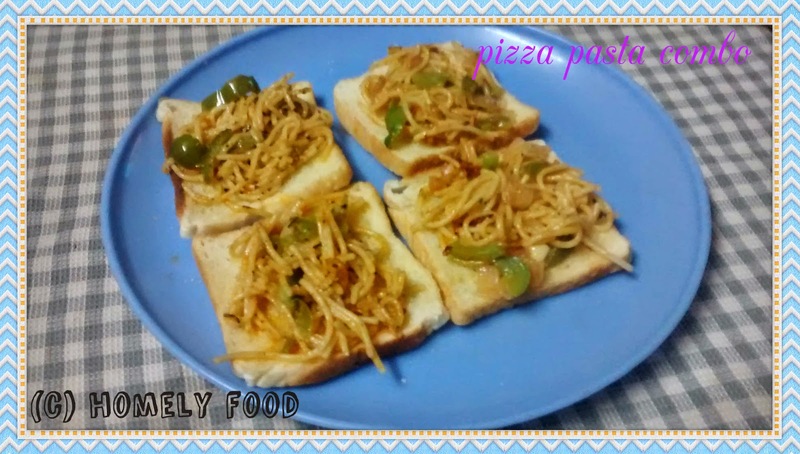 We have pizza and we have pasta but I am combining both the things here and for kids and adults its a hit. 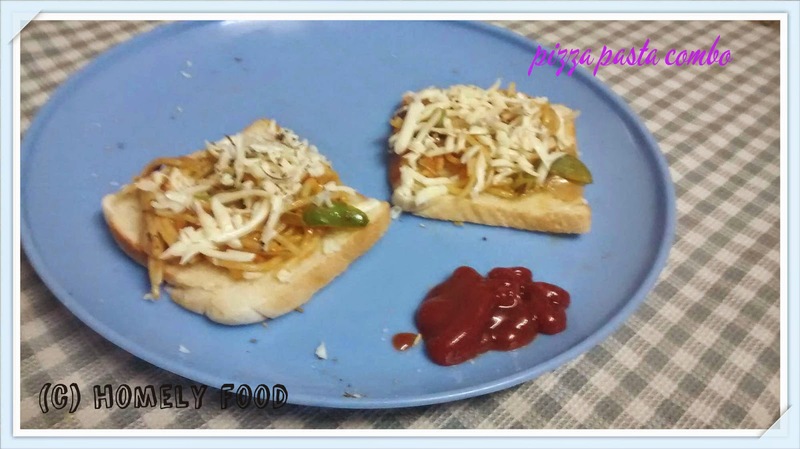 I have used bread here but you can try with pizza base too. 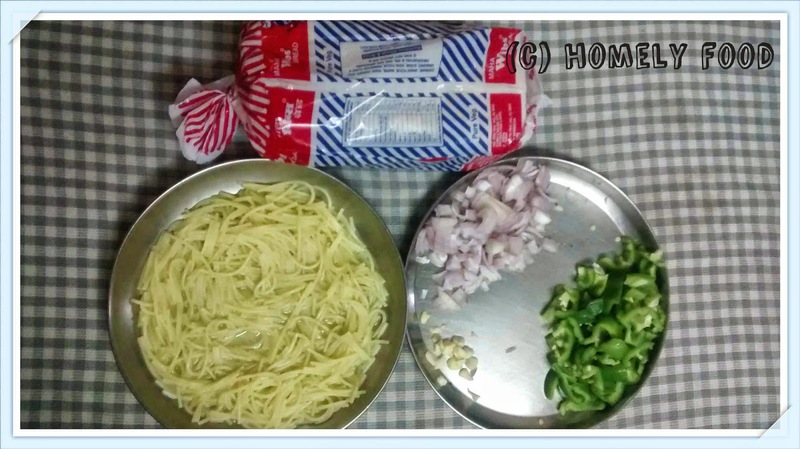 So lets see what we need here to make this yummy pizza pasta combo. Break long spaghetti into bit small pieces and boil it with little salt. Keep it tender and not mushy. Drain excess water and put 1 tbsp oil so it does not stick. Chop onions, capsicum and garlic into small pieces. Spread butter on bread and lightly toast it in pan or you can grill it as per your requirement. Now comes the fun part.. 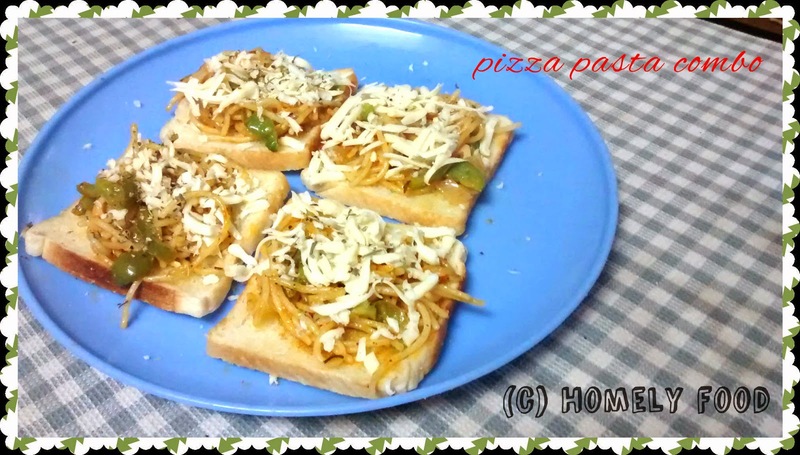 Spread the cooked pasta on the buttered part of the bread and then put grated cheese on top. Sprinkle oregano and pepper powder and chilli flakes on top. I didn't bake it again in oven as it looked good this way only. Your delicious pizza pasta is ready. Have it in breakfast or evening snack time. 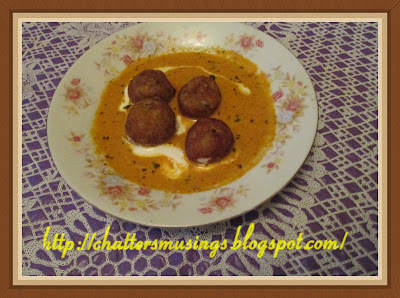 Serve it as you like..
Let me know your views on this... till then enjoy.. Note: I have used long spaghetti here but you can try with any other pasta. Hi friends! 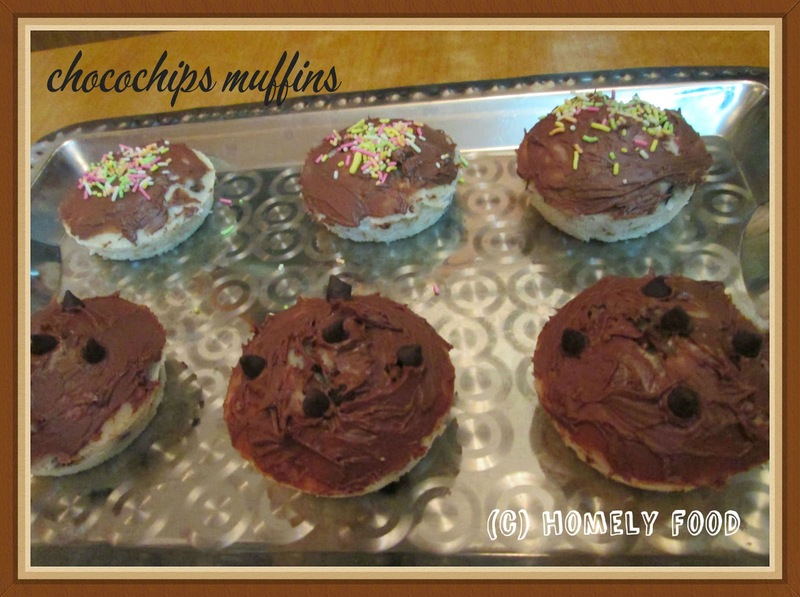 Today is my another baking dish which is chocochip muffins. 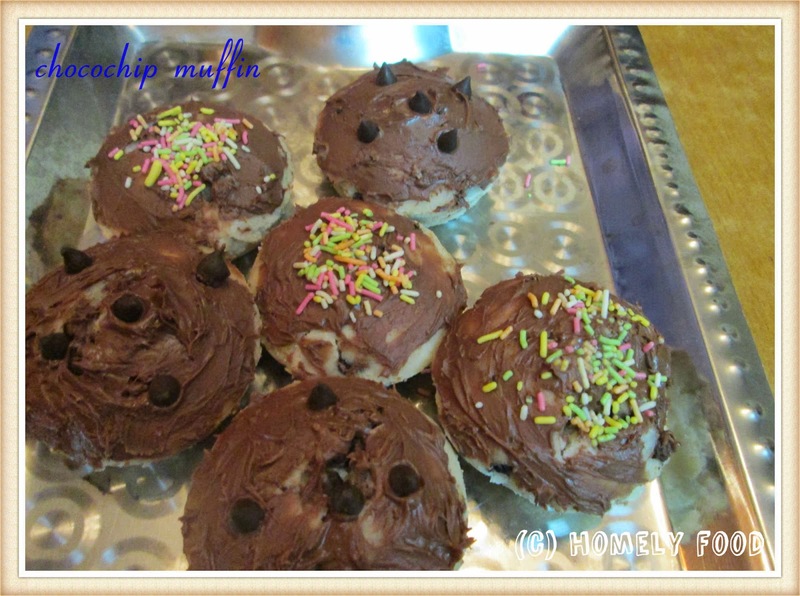 Muffins are cute looking cupcakes and easy to prepare. I have tried this few times and I believe this time I got a better result compared to previous occasions. Basic recipe is same which you can use for your normal vanilla cake. Let us see what ingredients are needed here. Preheat oven to 170C. Oven settings vary but for me I actually this time used 160C. Line your cupcake tray. I have a simple tray so I brushed them with bit of butter and flour. Seive together dry ingredients like sugar, flour, baking powder, baking soda and salt. Mix them well in a bowl. Take another bowl and mix oil, yoghurt and vanilla essence and mix them well. Now slowly add wet ingredients to flour mix and fold it gently and if needed add milk and see no lumps are formed. Make it into creamy batter. Fill your muffin try with this batter but only 2/3rd full as batter would need space to rise. Bake in oven for 20mins or until a toothpick inserted inside the cake comes out clean. Remove from oven and let the muffins cool on wire rack. 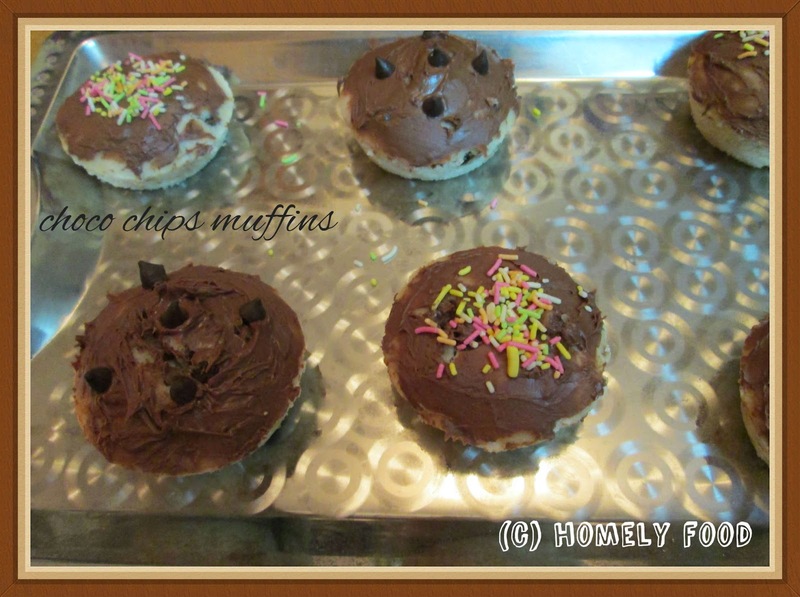 After cooling, spread nutella on top and decorate with either sprinkles or chocochips or any other decorations. 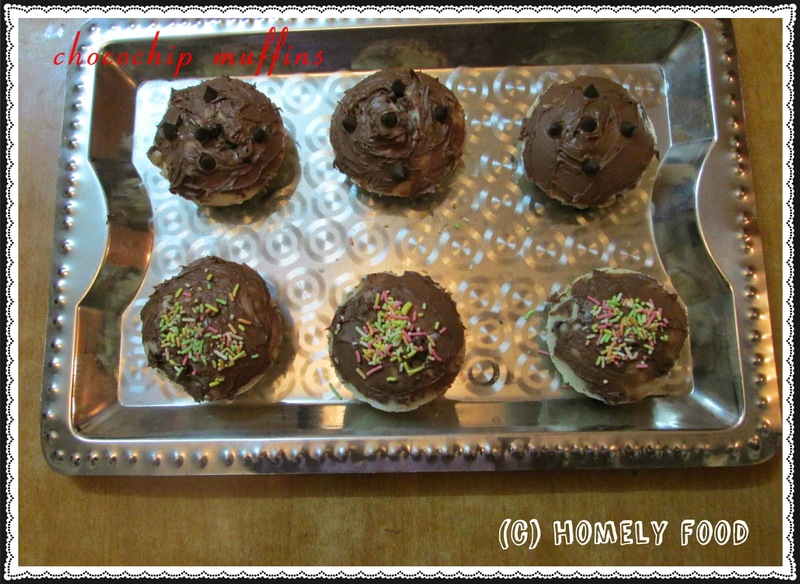 After many attempts this time my muffins came out very good and my little one helped me with spreading nutella and choco chips. 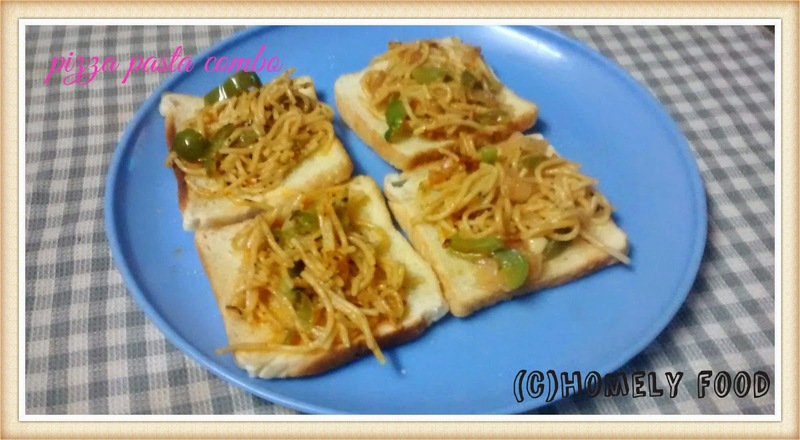 The spread has not come out good but the taste was too good. Above quantity would make aprox, 12 muffins. Try it and enjoy and you can use the frosting of your choice.